3. What does number 6 indicate? 5. What does number 8 indicate? 6. Which number indicates an example of cardiac muscle? 7. Which type of muscle is stimulated by nerve impulses from the brain and spinal cord? 11. Where on the body would you find the trapezius? 14. 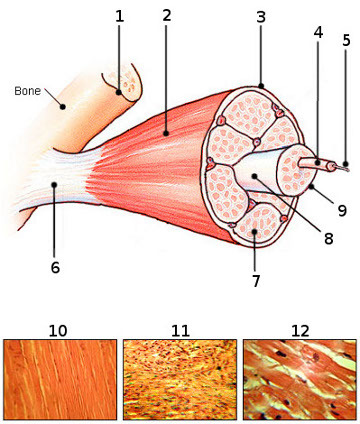 How many main types of muscle tissue are there? 15. Which type of muscle is also known as 'voluntary muscle'? The anatomy of bones, quiz 1 - Test your knowledge of the terms used to describe the parts of bones. Joints, quiz 1 - How much do you know about the joints of the body? The muscles of the body, quiz 1 - Learn the names of the main muscles of the body.